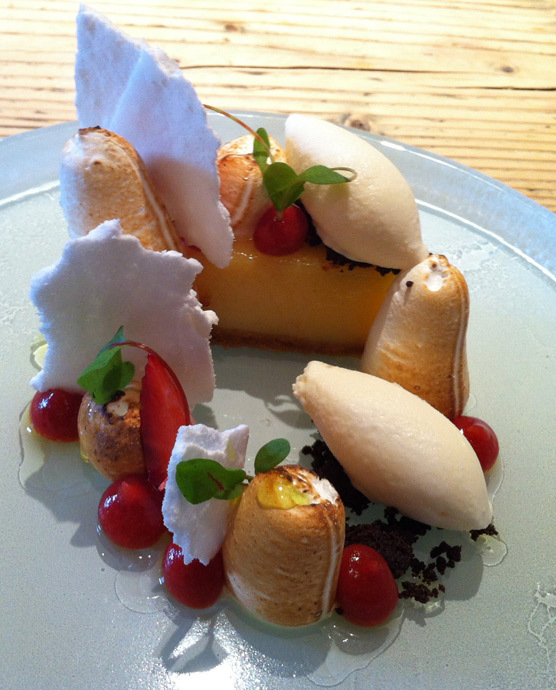 Freemasons at Wiswell has been on our 'to do' list for a while now, after @ChefLukeThomas recommended it on Twitter. It's won a string of awards in the past couple of years, including a Bib Gourmand from Michelin and Lancashire Life's Dining Pub of the Year. We did get a little lost, as the Satnav suggested we had reached our destination in the middle of a street, with no sign of the Freemasons. Luckily, a lady doing her garden came to our rescue, and advised that we had to park on the road as the restaurant was up a little path. You walk up said path and there it is! 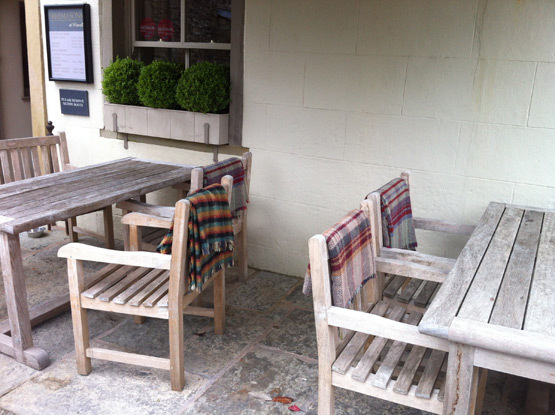 Gorgeous exterior complete with woolly blankets on the seats! We were seated quickly and given a copy of the Jubilee menu. To start, I plumped for English asparagus and Lancashire cheese soup, and my husband had topside of English Rose Veal with peas and bacon. We were also given a selection of soft home-made bread. 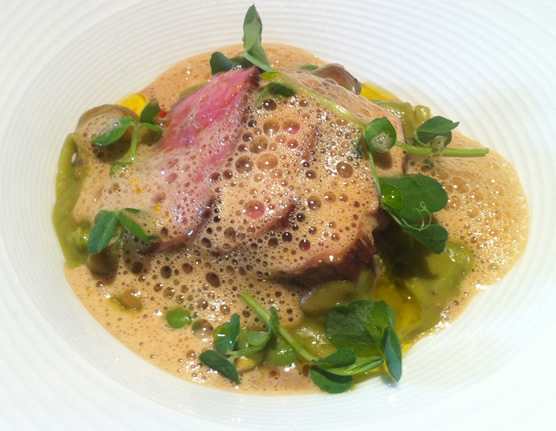 The veal was beautifully pink and came with a fresh pea and bacon sauce. 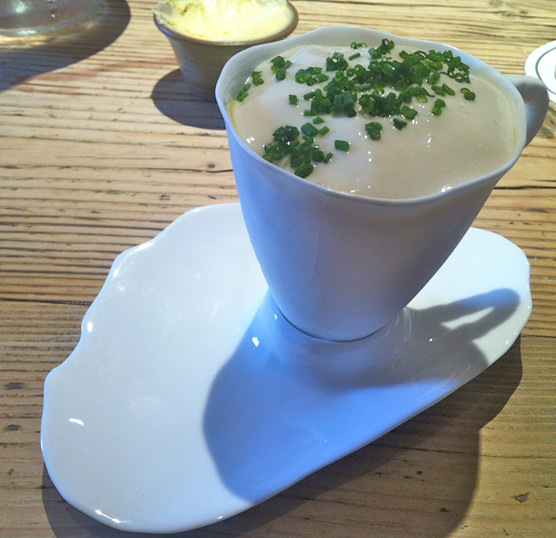 Whether it looks it or not, it was a far cry from the one-time 'Michelin essential' pea puree with bacon foam! This was more about flavour than the quintessential aluminous green puree of 2009. 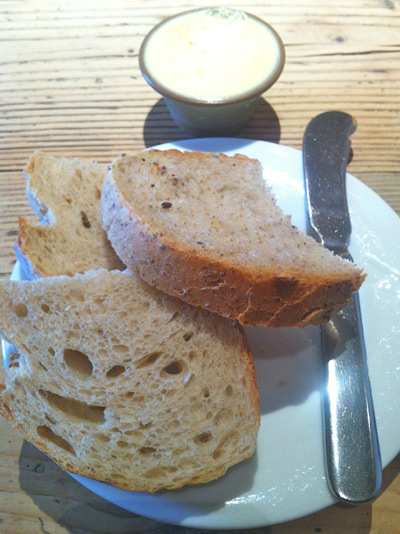 I'm always a little wary of having soup as a starter, as I often struggle with a large bowl of soup and a main course. This was ideal because it was just a cup full! A thick Lancashire cheese cream sat on top of a fresh asparagus soup filled with what tasted like pickled asparagus pieces. Very light and not at all over-filling. We selected pork and beef from the mains. The pork came in the form of slow cooked belly, gammon, egg and pineapple. This was not at all like you might expect from your local Tavern. The gammon pieces were crispy and had a tang of star anise whilst the belly was soft and tasty. I loved the fact the pineapple came two ways, as a thick sauce and as 'scallops'. The egg had a fried outer coating but was bright and runny on the inside. 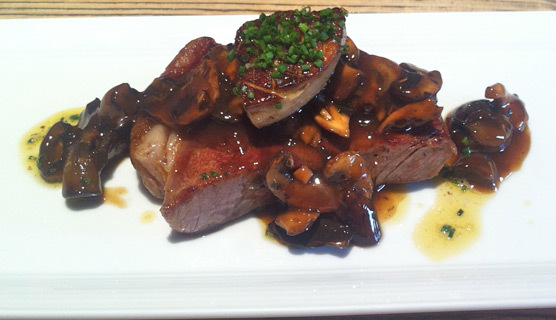 The beef was a sirloin of Devonshire Estate beef and came with mushrooms and foie gras. I'm not a foie-fan myself, so I left that to my husband (who very much is!). The sirloin was served as a thick steak with a rich sauce, which was soaked up by the mushrooms. He was particularly impressed by the way the foie gras melted onto the steak when cut. Now then. Desserts. You know I am all about the cake and puddings. Before I go any further, know that I have eaten a lot of deserts in my time, ranging from your local cafe to three starred restaurants. The desserts here were a tour de force! They were absolutely out of this world. I am just sorry that my photos will never do them justice! We always get different desserts so we can try a little of each others'. I could have eaten both. Twice. My husband had the duck egg tart with variations of raspberries and I had the Almalfi lemon meringue pie with Wiswell Moor. The duck egg tart was like a deconstructed trifle, but every every element had a purpose. 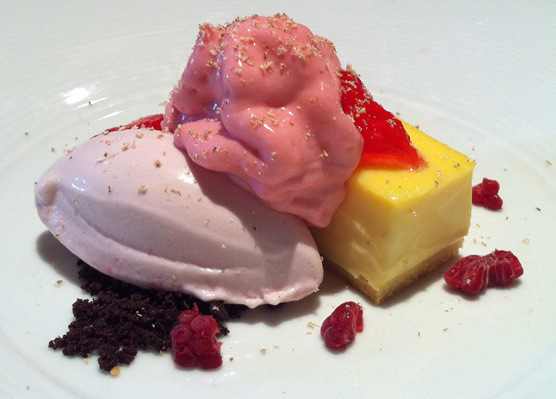 The variations of raspberry appeared to include ice-cream, jelly, raspberry pieces and some sort of raspberry creme patisserie. The duck egg tart itself was really rich in flavour; almost like a condensed egg custard. The whole thing was really light, and the tanginess of the raspberry meant it wasn't at all stodgy. The dessert below will be one of my favourites ever for some time I think. Again, the 'pie' did look very similar to the egg custard, but I can forgive that as it was sheer brilliance. This is up there with the famous financier! The lemon filling was like a sweet yet tangy set curd, but the accompaniments sky rocketed this dessert into the realm of perfection. Moorland berry puree was dotted between stalagmites of soft browned meringue, with pieces of white chewy meringue poking out of the sides. The whole thing was drizzled in some sort of sugar syrup, droplets of lemon gel and topped with a zesty ice cream. I cannot describe in words how good this was. 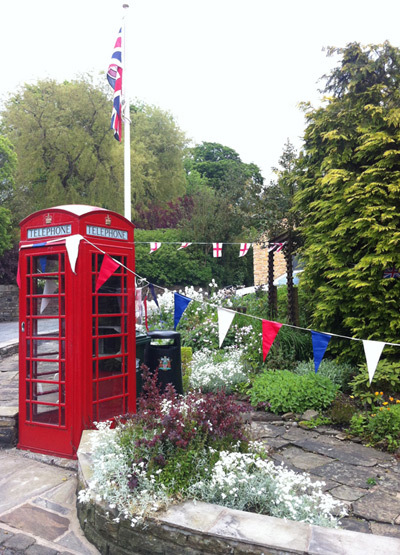 We'll definitely be planning a return trip here, perhaps for one of their chippy tea nights! Ooh it all sounds delicious... I want to sit outside with a glass of wine and one of those blankets over my knees! Great review! Thanks Sophie! It was sooo good! It's a hidden gem this one! Ooh glad to be of service! We really liked it!